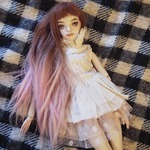 Awww... when I fell MADLY in love with EDs, I was searching for any single picture of any of Marina's doll in web... It's as if I were back in time about 3 years ago... I love Arya's pictures, she is beyond beautiful. Thanks for sharing. She is one of my favourites. Love her! Oh gee I do remember!!!! So lovely! The Bride came packed like that too! Still have the box. Love how her eyes are painted, and of course her helmet with the moonstone! She is beautiful, such a pretty face! I do remember! How beautiful she is! I love the picture of her in the snow with the blue sweater and hat, she's so pretty in the natural light outside. I know Marina had a box designed with Artificial Intelligence on it, I wish she would have it made, I'd love to have it. I love this doll so much- it doesn't matter how many times I see her. She is a real gem! Love this girl! Her short hair is so lovely - and that helmet is so intricate! A beauty in all ways. I must say I enjoyed your BO. She is beautiful girl.